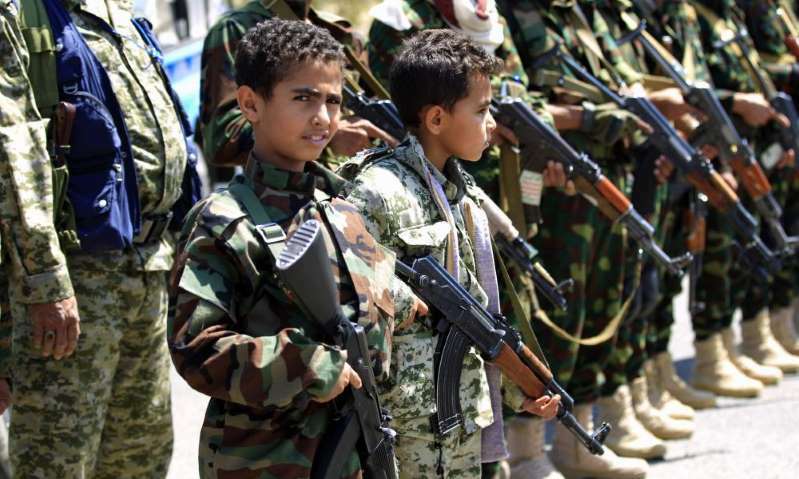 © Provided by Guardian News Yemeni children hold weapons during a gathering in the capital Sanaa to show support for Houthi rebels. The civil war in Yemen is one of those obscure conflicts that feels as though it has been going on for ever. In the space of little more than three years, the conflict has become what the UN and aid agencies agree is the world’s worst man-made humanitarian disaster, with 16,700 civilians killed or wounded, 8.4 million people facing famine, a nation torn apart and an economy destroyed. The killing of children, hit by missiles and shells smashing into their homes and schools or stricken by disease and malnutrition, has come to symbolise Yemen’s war. The UN’s latest Children and Armed Conflict report found that 1,316 children were killed or maimed in 2017. Just over half died in air attacks by the western-backed, pro-government coalition, and many others at the hands of Houthi rebels. Yet perhaps most extraordinary, and dismaying, is the counter-productive response of the governments principally concerned. There has been intervention aplenty since 2015 – by the Saudis, the UAE, Iran, the US and the UK – but their actions have served to inflame the conflict, not extinguish it. In the very limited discussions about Yemen among national leaders at the UN last week, it was clear the conflict is getting worse, not better. August was the most violent month so far this year, with nearly 500 people killed in nine days, according to the International Rescue Committee (IRC). There has been a 164% spike in civilian deaths in the last four months, and this rate of attrition is expected to rise further amid the Saudi-led, pro-government coalition’s resumed offensive on the port of Hodeidah. Overall, since 2015, the coalition has launched 18,000 airstrikes, one-third of which are said to have hit non-military targets. Miliband’s assessment that no side was winning the war, and his call for an immediate ceasefire, has been echoed by other agencies. “Yemen is a disaster and I don’t see any light at the end of the tunnel right now,” David Beasley, director of the World Food Programme, said last week. Access for relief agencies was a particular problem, he added, accusing the Iranian-backed Houthis of “breaking every human principle imaginable”, including impeding food deliveries. In a commentary published by the International Crisis Group, Yemen consultant Peter Salisbury warned that the collapse in Geneva earlier this month of the latest UN-sponsored peace talks could trigger the war’s bloodiest chapter yet. “An avoidable tragedy now looks inevitable absent swift and forceful intervention by UN security council member states, the US in particular,” Salisbury wrote. Hopes that Saudi Arabia and the UAE, currently intensifying military operations, will voluntarily desist appear forlorn. Nor is there any indication that Iran, which believes it has the upper hand and views Yemen as part of a region-wide struggle with the Sunni Arab monarchies of the Gulf, is ready to back off. Donald Trump’s assertion at the UN that Tehran was causing “havoc and slaughter” in Syria and Yemen, and his praise for Saudi leaders, suggests escalation is more probable. Nor is there much likelihood that a Brexit-obsessed Britain, despite harsh domestic criticism of its military assistance in planning airstrikes and its arms sales to the Saudi regime, will act. France, another UN security council permanent member, is similarly compromised by prior support for the coalition and lucrative arms sales. Like the US and UK, it reportedly has special forces on the ground, engaged in counter-terrorism operations against Islamist extremists. All of which leaves one possible ray of light for the suffering Yemenis. Last week more than 50 members of the US House of Representatives backed a bipartisan resolution invoking the 1973 War Powers Act, declaring that Congress never authorised US support for the coalition in Yemen, as it is legally bound to do under the act, and directing Trump to withdraw all American military personnel. Action is also pending in the US Senate, where Bob Menendez – the top Democrat on the Senate foreign relations committee – is blocking a $2bn arms sale to Saudi Arabia and the UAE. “Widespread destruction and disease [are] contributing to the world’s worst humanitarian crisis. US-fuelled planes continue to drop US-made bombs on innocent victims,” said Democrat Ro Khanna, the House resolution’s lead sponsor. A showdown vote is expected after November’s elections. Both moves are certain to be fiercely opposed by the Trump administration, which argues its military assistance and expertise reduces the number of civilian deaths. But both reflect growing public abhorrence at a series of atrocities, including a horrific bus bombing that killed dozens of children last month, which could implicate the US government and personnel in war crimes.